It's interesting to contemplate what reasons there may be why the Dallas suburbs have become a global Mecca for connoisseurs of ultraviolent, deeply creepy computer games. Maybe there's something in the water supply east of Buckner Boulevard, something to lend credence to the local ghost stories surrounding the White Rock Lake Reservoir. Maybe it's a long, weird hangover from the whole City of Hate thing. Or maybe it's a by-product of the enhanced fight-or-flight responses needed to survive a daily commute that involves the LBJ Freeway. Whatever the case, in creating some of the most honestly revolutionary computer games ever made, the crew at Mesquite's id Software seem to have tapped into a peculiarly suburban taste for hyperstylized darkness. The nightmarish vividness of the atmosphere and first-person gameplay in titles like Doom and Hexen provide the sensory overstimulation the market demands, while the fantasy elements abstract the carnage just enough to keep it at arm's -- or gun's -- length. Along the way, the "wizards of id" have become high-tech folk heroes. They're software's answers to Karch Kiraly, the volleyball player who has parlayed his multiple Olympic championships into a young fortune built, it seems, almost entirely upon hanging out at the beach. It's the kind of success that defies envy or analysis: These guys spend their days doing what they love, what they're good at...and they've found a way to get paid for it. Whoa. Sign us up for that. But the real killer (as in killer-app) aspect of the game is its Internet-friendliness. Rather than trying to deviate significantly from the formula that made Doom the most popular title in computer-gaming history, the developers focused much of their energy on enhancing the multi-player capabilities that have been a major factor in Doom's unusually long shelf life. The emphasis on networking is evident in id's development of QuakeWorld, a client application designed (when used with a QuakeWorld server) to reduce or eliminate lag, level the playing field for dial-up players with slower connections, and allow play from behind firewalls. And the emergence of "Quake clans" -- roving tag-teams of five or more players, with names like Volcano Gods and The Brothers Gib -- is bringing gamers ever closer to a worldwide virtual steel-cage death match, where Quakers may frag at will and en masse (indivisible, with liberty and blood sport for all). Oh, and Quake also has music and sound effects by Trent Reznor. Well, whaddaya know. McGee talked to Hope and Vaseline in October. Here's what he had to say. How long was Quake in development? We were working on Quake for almost a year and a half. At what point did Trent Reznor and NIN come on board? Trent started talking to id around the time we released Doom II. He basically saw the entire development from start to finish. His actual involvement in creating sound effects and music spanned that entire time, on and off. It seems safe to say that Quake was one of the most highly anticipated games in history from the very beginning. What sort of problems did those expectations present for you? Or did you try to ignore them? The Quake project was a lot of work for us all. There were no real problems during the development as far as the technical parts went. Most of our snags came from personal or legal problems. This is not to say that creating the game was a breeze, but the majority of the challenges were ones we've faced before, and overcome every time. There was a persistent rumor that you might not be allowed to use the name "Quake" because of copyright concerns. Well, the legal stuff was really just a farce. There was a German company that did a copyright on just about every mutation of the word "Quake" you could imagine, and then tried to sell us the rights to the stupid thing. Our lawyers finally convinced them that they would be better off just giving the word to us...and they stopped being stupid. Quake originally had a medieval theme. What made you decide to take a more futuristic direction with it? Well, this happened because we decided that we didn't really like playing medieval action games. We thought we wanted to do one, but we changed our minds. How did that affect the music and sounds that ended up on the CD? It affected some of the original sound effects Trent sent us. We basically could not use them. But the music was not started on until the last weeks of Quake's development, so it had no effect on that. For months before the game's release, word was that there would be no playable music on the CD, just sound effects. Now there is music -- why the change? Well, the idea of having music in the game was scrapped, mainly because we felt the game would have enough ambiance to get away without it. Towards the end, Trent sat us down and explained that he thought music was really missing from the game. He offered to work with us on this, and we accepted. Of course. What has NIN's involvement meant from a publicity or marketing standpoint? Other than the obvious interest from fans, has there been a backlash from gaming vets who thought the job should have been done by "real" FX guys? Aside from the interest of fans, I am not sure if that many people buy the game realizing that he did work on it. We were told not to put stickers on the CDs saying things like "sound effects by Trent," et cetera, and we understood and respected this. The sound effects in the game have never come under fire from anyone. If it sounds right, who's to say that it wasn't done by the right guy? Industrial-metal-whatever musicians seem to be getting involved in the development of a number of games now -- Descent II had a soundtrack by Nivek Ogre of Skinny Puppy, and there are rumors that White Zombie and Al Jourgensen are doing music for games. Is this sort of collaboration the wave of the future or a momentary phenomenon? I really don't know. Our involvement with Trent stemmed from a friendship that was based on mutual interests -- playing games and music. The work aspect of it was not our primary interest. Trent likes games, and he thought it would be exciting to work with us on one. There are a few of us here that were listening to NIN through Doom, Doom II, and other projects and really appreciate their music. It just all came together with Quake. Is Quake going to become another Doom, with official sequels, spinoffs, et cetera? Or is the intent behind Quake-C to let users create their own variations and leave you free to work on new concepts? We will do a Quake II, and there will be other games released that use the Quake engine. Once we are finished with Quake II, we plan to move onto the next big thing. Quake-C is there because we really enjoy seeing what people can do with our games. It's not really intended to leave us free, but it certainly does increase the amount of time the product will remain alive. Id seems to value player feedback a great deal, judging by the participation of various personnel on the Doom and Quake Usenet groups and IRC channels. And you brought players to your headquarters to test Quake in its early stages. How much does that feedback affect the final product? Did they offer any ideas that really struck you, as in "hey, that's good"? Well, by the time we had people here testing Quake, things were pretty finished. They basically came in to help us make sure that we were creating an enjoyable (and playable) game. Lately, we have seen many things that people have created using the Quake engine that have impressed us, though. They are adding in new weapons, monsters, and items that are really great. There is also a group of people out there who are creating all-new levels for the game, and many of those are also very impressive. Can you talk about plans for the sequel yet? I cannot talk about this at all right now. Do you have any personal favorite elements in Quake -- a piece of work you're especially proud of, or a sound effect you love, or a moment that scares even you? Well, during the Quake project I was working on three separate elements of the game at once. Not only was I working closely with Trent on sound effects, but I was also doing level creation and programming of game elements. I guess the one singular item I can point at and say I am most proud of would be the Nail Gun. I created this weapon before we even knew that we would be working with the Nails guys, and then after we had been working with them for a while it seemed kinda ironic to me that I had done something that in its own way kinda tied them into the game. That's when we did the NIN boxes filled with nails for ammo. At first that was a joke, but Trent liked it, so it stayed. Besides, it's cool to run around and see the logo for your favorite band plastered on the sides of the ammo boxes in a game you helped create. When will Quake be ported for non-PC platforms? This is in the works now. There are no release dates. What's your favorite Star Wars movie, and why? The Empire Strikes Back. Reason? I don't know...it's just the best one. 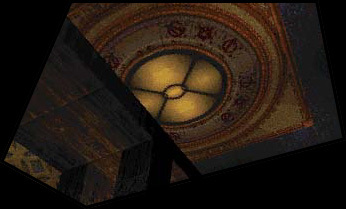 Check out Blue's Quake Rag for the latest on Quake and QuakeWorld. For other Quake links, visit Venkman's Quake Page. Features pictures of the cast of Friends getting crushed by id-monsters. Check out the Quake Banana. And the patch that lets you flog the bloody guts out of an opponent after you've killed it, if it didn't have the common decency to gib when you killed it the first time. Heh.